If you've encountered one bottle of bitters in your life, chances are it's this one. It's the bottle with the yellow cap and the label that's too large for the bottle. You know the one. It's called Angostura bitters, which has been around since 1824, produced by House of Angostura in Trinidad. Angostura actually makes two bitters products--the aromatic bitters are the best-known, and when people say "Angostura bitters," they mean this one. On its own, Angostura bitters have a marked spiciness that hits you immediately, followed by its sharp bitterness and subtle sweetness. When mixed with a little club soda and sugar, the bitterness dials down a lot and you can really taste the spice mix. Just what spices are in it no one knows (well, no one apart from a few in the company that guard the secret recipe). We do know it contains gentian root, since it says so on the bottle. We also know it does not contain the bark of the angostura tree, despite its name. I detect hints of clove and cinnamon for sure. Angostura bitters show up in many cocktail recipes, in part because they've been around for so long, but also because their rounded spicy flavor makes them a versatile choice for many drinks. 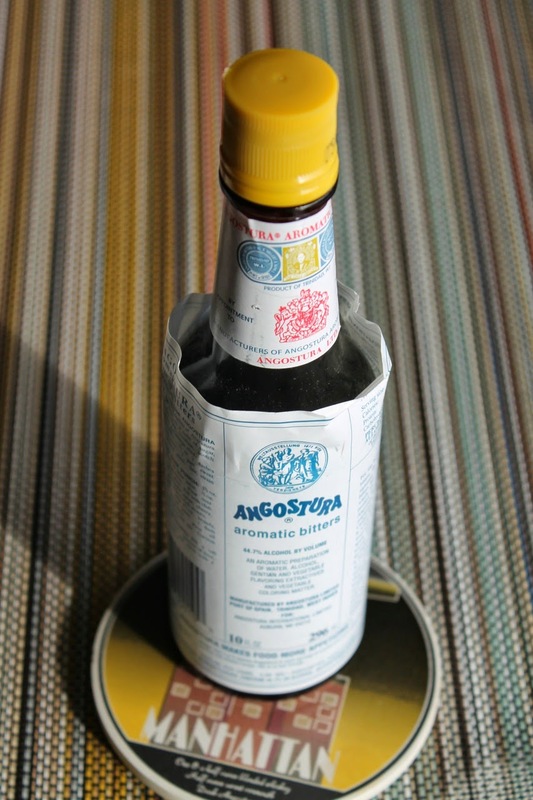 Notably, Angostura are one of the few brands of bitters to have survived Prohibition. Several notable classic cocktails are made with Angostura bitters, including the Old Fashioned (although I'll be making it later this week with different bitters), the Champagne Cocktail and the Manhattan. In Imbibe!, David Wondrich posits the Manhattan as the perfect middle ground between the low-impact Vermouth Cocktail and the high-octane Whiskey (or gin, or brandy) Cocktail. The exact origin of the Manhattan is unclear. Wondrich runs through several stories, some of which point to the Manhattan Club, a New York City Democratic club established in 1865. Thus, the exact date the Manhattan came about is also unknown, although it must have been sometime during the late 1870s to 1880s, as it first appeared in print in 1882. Wondrich includes recipes for three versions of the drink, the third of which, Formula #3 from 1892, is closest to what we today call the Manhattan, employing a 2:1 ratio of whiskey to vermouth plus bitters (it also has absinthe, maraschino and extra sugar). 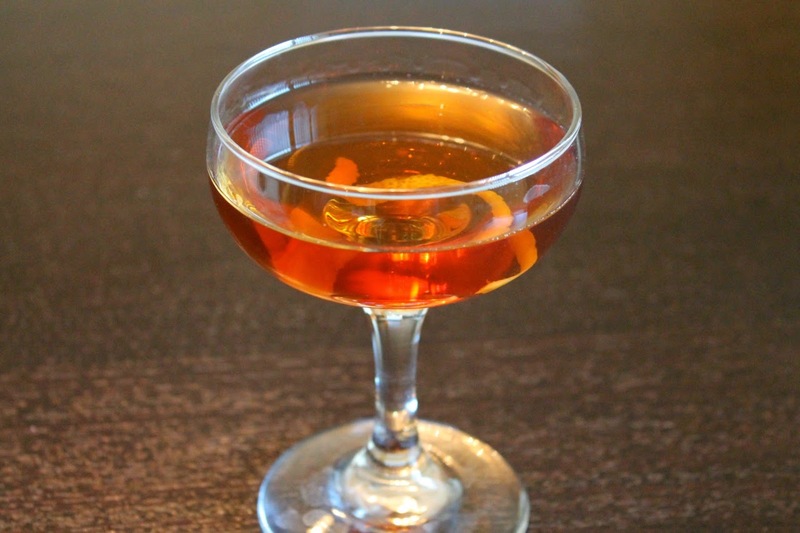 Dale DeGroff, in The Craft of the Cocktail, called the Manhattan the "quintessential rye cocktail," although he acknowledges regional variations that prefer bourbon or brandy. The recipe below is the one from Brad Thomas Parsons' Bitters, which I like because it uses a mix of Angostura and orange bitters to give the drink both spice and a touch of orange sweetness. Combine the whiskey, sweet vermouth and bitters in a cocktail mixing glass half-filled with ice. Stir until chilled and diluted. Strain into a chilled coupe and garnish with lemon twist. More interesting history. Also: We have a Manhattan coaster? Yeah, we have like two sets of cocktail-themed coasters. I have the champagne cocktail coaster by my side of the sofa.